You can walk into most any generalized bookstore and find comic strip collections. Peanuts has been perennially available for decades. Garfield and Dilbert, certainly. 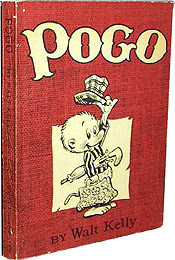 The past several years, we've seen some more upscale collections of older strips like Pogo and Little Nemo. Then there are other strips that are collected for a time, but the strip's popularity wanes and the collections are discontinued. Heathcliff enjoyed many collections over the years, but as far as I can tell, nothing new has showed up in book form since around the time the original creator, George Gately, retired in 1998. Again, the same price and cost logic from the previous example applies here; it's just that the book audience that was once in place, for whatever reason(s), no longer is there. The first and last examples make the most sense to me. I mean, if you decide to put out a book and it sells well, then why not put out another one? And if it sells poorly, then you stop. That's kind of a basic business logic. That middle example, where you never release a collection at all, I'm a little fuzzy on. I don't quite get how you might determine whether there's a sufficient market for book, based on newspaper popularity. I mean, why did The Lockhorns get several book collections but The Born Loser didn't? Now, to throw something new and interesting into the mix, some of the newer strips out there have allowed the creators to retain the rights to publish reprint collections themselves. Darrin Bell has done several print-on-demand collected editions of Candorville as has Keith Knight with The Knight Life. And Bill Amend did several digital-only collections of Foxtrot, which is already published in dead-tree collections by Andrews McMeel. Now, more than likely, these guys aren't selling enough books by themselves to earn a living. And the publishers have determined that the books wouldn't be worth the effort to produce them themselves. Not necessarily that they wouldn't be profitable, just that they wouldn't be profitable enough by whatever metrics they're using. But that means that A) the syndicate isn't confident the strip is popular enough currently, and B) the syndicate isn't confident the strip will be popular enough in the future. Which seems to me like a very strange bet to make. I can understand, conceptually, that they might want to put a strip out in the not-terribly-expensive-for-them newspaper circuit, but not in the considerably-more-expensive-and-less-likely-to-be-profitable book collection circuit. But then to make an agreement which removes the possibility of future income (for the syndicate) if the strip becomes more popular? I'm not sure I see the business logic there. Maybe it's a way to compete with webcomics, who generally own the rights to their own work lock, stock, and barrel? Syndicates can only pull in new talent only if the creators don't have to give up reproduction rights? Maybe this is why I'm not in the syndication business!